fun centers and similar locations. 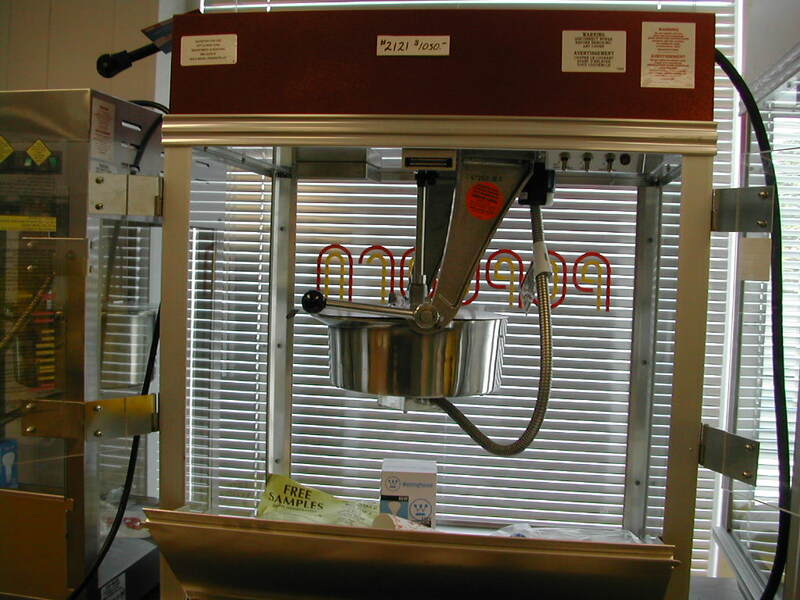 This all stainless steel cabinet popper maximizes popcorn production from any 15 Amp line! Easy to keep clean. Safe twin arm double-hung kettle suspension. Ideal for schools, concession stands, rentals and more. This attractive popper features a red powder coated dome, satin anodized and welded cabinet and the famous Whiz Bang kettle. Compact 20"x20" footprint, yet larger popping capacity. Over 250 oz. of popped corn per hour makes this compact 12 oz. machine a gold mine. Welded bronze anodized frame. Woodgrain vinyl-coated steel top. Etched glass windows. This unit features a heavily chrome-plated steel kettle mounted in the extra strong cast aluminum twin hanger arms for operator safety. Removable kettle for easy cleaning. The world’s favorite full size popcorn machine. Extremely heavy-duty construction, welded aluminum frame, extruded corner posts, antique brass-like finish and the high performance Whiz Bang Kettle. 14 Ounce Kettle, BEST SELLER! Click for More Info! The Econo 14 is the world’s most popular commercial 14 Ounce Popper! 300 Servings per Hour, Etched Popcorn Sign on Front Window! Maximum output and a minimal footprint (20"x20") make the ProPop perfect for retail locations where space is at a premium. Neon header also available. Not Wired for External Oil Pump BEST SELLER! This profit maker features a deluxe 14 oz. kettle, durable Gold Medal construction and a forced hot air heater blower system for "kettle crisp" popcorn. Neon is the ultimate sale-builder. All of the great Citation features with added sales appeal. Shown here on #2111SS Stainless Steel base (sold separately). The most deluxe 14 oz. kettle popper available! The #2102 is available with illuminated header (as shown), neon header, or illuminated white dome. Big Eye Electronic Controls ensure perfectly popped popcorn every time. Heavily chrome-plated deluxe steel kettle. Kettle removes for easy cleaning. Maximize output of perfectly popped popcorn with minimal electricity. The Macho Pop uses 1920 Watts- a 20 Amp plug lets you operate almost anywhere. The Big Eye Electronic Controls help you pop more safely and efficiently. All stainless steel cabinet and stainless steel kettle. The Econo 16 features the deluxe heavy-duty steel kettle with extra chrome-plating. Illuminated "popcorn" header draws sales-building attention. Strip heater corn freshener system. Not pre-wired for oil pump. The popper of choice for about half of the new discount department stores. High quality construction and all of the big machine features. All of the Citation high performance features with attractive antique styling. The Astro 16 is maximizing profits in concession trailers and other high traffic locations. Equipped with the Big Eye Electronic Control System for better popping performance.